NASHVILLE, Tenn. (AP) — Kevin Byard no longer needs the tweet of Deion Sanders calling the All-Pro and Pro Bowl safety “a fan” as the lock screen on his cellphone. The Tennessee Titans safety believes he squeezed all the motivation needed from that Twitter exchange, which fueled him throughout the offseason in his quest to be the NFL’s best in his third season. That Twitter exchange in March started after the Hall of Fame cornerback and now NFL Network analyst tabbed Tyrann Mathieu as the NFL’s top safety. Byard tweeted at Sanders , asking how he didn’t mention either of 2017’s All-Pro safeties. Sanders responded he knew who players and former players believe is the league’s best. “You continue to be a fan and i will continue being the man,” Sanders wrote back to Byard on Twitter . Byard answered back that neither numbers nor film added up with Sanders overlooking Minnesota’s Harrison Smith, Earl Thomas of Seattle and Kansas City’s Eric Berry. Byard’s numbers in 2017 speak for themselves. Defensive coordinator Dean Pees has coached safeties such as Ed Reed in his career. He’s not looking to compare Byard to anyone, but Pees has made clear how impressed he is by Byard’s hard work, leadership and professionalism. “He’ll come in and tell me, we always try to keep ahead of them and let them know what’s coming in in the next day, and he’ll come back the next day and have a question on something we haven’t even covered yet, which tells me then he’s doing all the right things,” Pees said. 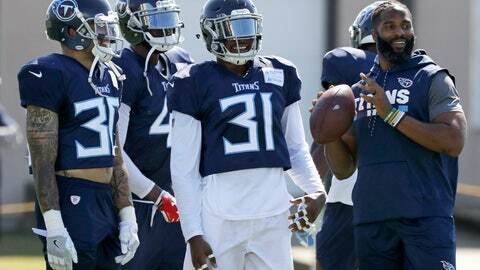 Byard had eight of the Titans’ 12 interceptions last season, and the secondary has been working together since March with the target of being the NFL’s best group. He’s already seen Byard meeting individually with Dane Cruikshank in training camp to help the rookie learn, impressive to see in a young player. The 5-foot-11, 212-pound Byard was the first pick of the third round in 2016 out of Middle Tennessee. Now the safety who’s always been confident in what he can do believes he can do even more in the NFL. “I feel like I barely scratched the surface with my potential,” Byard said.